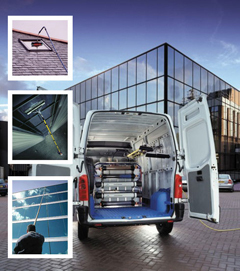 Commercial window cleaning companies are plentiful in the U.K. but finding one that suits your needs can be a challenge. The thing is this is a contractor's market. In other words, demand for commercial window cleaning is high while the supply of quality cleaning companies is barely keeping up, thus reducing the contractor's incentive for top quality service. If you need to find a window cleaning company, think through a few things before beginning your search. Right now you may just be thinking about looking at commercial window cleaning companies that do only that. But did you know it's not uncommon for companies to offer complete interior office cleaning as well? Some even provide full property maintenance contracts for less than what you would pay hiring individual services. If you can find a company that will take care of all your cleaning needs you will probably get a better price. The efficient scheduling of rounds is critical to the success of commercial window cleaning companies. Looking for a contractor who services your local area on a regular basis, and who can meet your demands for frequency of visits will make your business relationship much better. A contractor who comes to your area infrequently may pose dependability problems you don't want to deal with down the road. How big is your building? How many windows will need to be regularly cleaned? Does any of the work need to be done at height? Due to the Work at Height directive of 2005, commercial window cleaning companies are required to perform work from the ground whenever possible. If your building requires equipment to work at height, you need to make sure your contractor is qualified and has a good track record. The last thing you need is an accident and subsequent liability. There are two things to look at when it comes to billing and payment. The first is the question of how the contractor will determine your charge. There are several ways commercial window cleaning companies can bill a job; the contractor will use the option most advantageous to him. That's understandable. But it's no excuse for you to be taken advantage of. Make sure you know how the price was determined and that you are in agreement with it. Second, you need to agree with your contractor on a payment schedule. Some commercial window cleaning companies expect to be paid on a per-visit basis; others will bill monthly; still others expect the full contact amount to be paid up front. Payment terms need to be clearly spelled out on any contract you sign. The best way to gauge the quality of the commercial window cleaning companies you are considering is to acquire a few references from each. Call those references and ask specific questions about reliability, quality of work, professionalism, and anything else you feel is important. A reputable company will have no problem furnishing you with plenty of references. With these things in mind, you're ready to begin your search for quality commercial window cleaning companies. Always remember that you are the customer - a good contractor will do the same.